I picked up the most amazing herringbone wool skirt at the thrift shop last week. Soft, subtle shades of gray in a wee herringbone weave.... it's to become a pair of pants for Luke this fall. 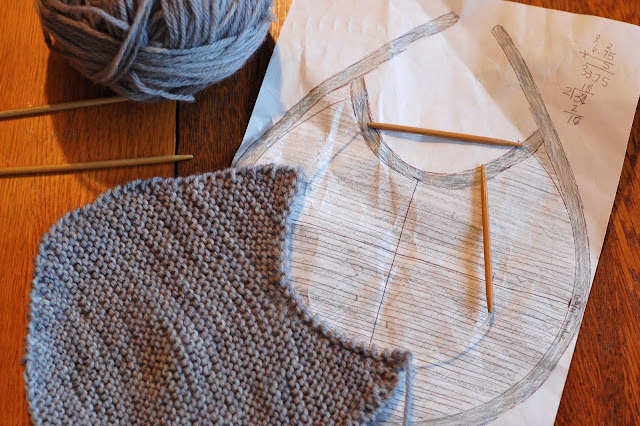 Of course the pants will need a handsome gray cabled sweater to match. Dyeing gray yarn to match is not as easy as it seems, though. My charcoal dye tends to result in a soft smokey blue tint and when painted over natural cream wool, revealing a hint of green undertone. Not suitable for my cabled sweater, but wait... the yarn's a perfect match for my layette sketches I drew a few weeks ago!!!! A modern bib, bonnet, and booties in a classic stormy gray. I LOVE when everything works out, even in a round about way.